DENVER (AP) — Sputtering into the postseason was no way for the Denver Nuggets to end their six-year playoff drought. 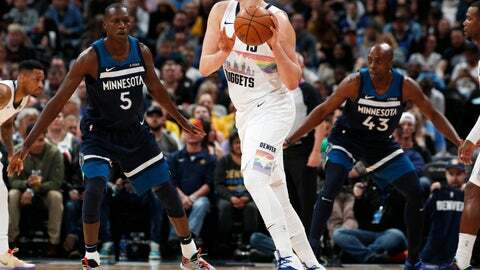 Nikola Jokic scored 29 points and had a key strip and two clutch free throws in the closing seconds and the Nuggets pulled out a 99-95 win over the Minnesota Timberwolves on Wednesday night that secured the No. 2 seed in the West. “We didn’t give up,” Jokic told the crowd after the Nuggets pulled out the improbable win by scoring the game’s final 15 points. That set up a first-round playoff series with the seventh-seeded San Antonio Spurs, instead of sixth-seeded Oklahoma City. The Nuggets were in danger of losing for the fifth time in their last seven games and falling to the No. 3 seed when they found themselves trailing by 11 with four minutes to go. The Timberwolves missed their last eight shots and the Nuggets scored on seven possessions. Apparently, so did the Nuggets. The comeback gave the Nuggets a measure of momentum heading into their first playoff series since 2012-13. Jamal Murray scored 17 points, including the go-ahead 3-pointer with 31 seconds left that put Denver up 96-95. Jokic stripped Wiggins and then sank two free throws for a three-point cushion. Wiggins’ 3-pointer to tie it hit the front of the rim and the Nuggets got the ball back. Paul Millsap was fouled at the other end with 4.2 seconds remaining. He sank his first free throw and missed his second, but teammate Will Barton corralled the rebound and dribbled out the clock. Gorgui Dieng added 18 points for the Timberwolves backups and rookie Cameron Reynolds scored a career-best 17 points, including a 3-pointer that put Minnesota ahead 95-84 with 4:01 left. The Nuggets know won’t get away with waiting until the end to turn up the energy and effort against the Spurs and coach Gregg Popovich. “It’s a good preparation for us going into the playoffs,” Millsap said. A year ago, these two teams met on the final day of the regular season with a lot more at stake. The Timberwolves won that one in overtime in the first final-day play-in game in the NBA in 21 years, ending a 14-year playoff absence and extending Denver’s drought to six seasons. Then, All-Star Jimmy Butler demanded a trade that torpedoed the Timberwolves, who fell to 36-46 and reverted to also-ran status while the Nuggets put together a 54-28 breakout for their first trip to the playoffs since George Karl was their coach. Timberwolves: Minnesota played without starters Karl Anthony-Towns (right knee), Jeff Teague (left foot) and Robert Covington (right knee) and key reserves Taj Gibson (left calf) and Derrick Rose (right elbow). Nuggets: Denver finished an NBA-best 34-7 at home. … The Nuggets earned a No. 2 seed in the Western Conference playoffs for the sixth time in their history and for the first time since 2008-09, when they last won a playoff series, 4-1 over the Mavericks in the conference semifinals. They have lost their last five playoff series. … Jokic also pulled down 14 rebounds. Timberwolves: A search for a president, followed by decisions on GM Scott Layden and interim head coach Ryan Saunders. Nuggets: A return to the playoffs after a six-year absence, facing the San Antonio Spurs in the first round.